Wine is a social lubricant and has played an important role since ancient times. 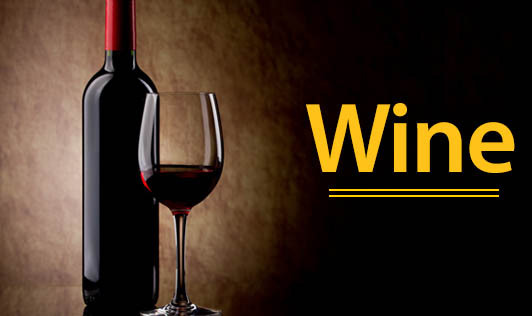 Wine is an alcoholic beverage made from fermented grapes or other fruits. The two major types of wine are red wine and white wine. Sharing wine among friends and family members often adds zing to any celebration. With the cold winter and Christmas ahead, wine is an ideal drink to celebrate the good times ahead. Lowers risk of heart attack and heart diseases: Moderate wine drinking is known to reduce the risk of heart diseases and heart attacks by up to 30% when compared to non-drinkers. Lowers risk of type 2 diabetes: Studies reveal that moderate wine drinking can cut down the risk of developing type II diabetes by 30% when compared to nondrinkers. Fact: Wine has proven several contributions to health when consumed in moderation. Fact: There is no definite correlation between the price and the quality. Wine is known as a social beverage. Enjoy it with your group of friends and family. Wine tastes better with food and for some people the opposite may be true. The standard rule is to serve red wine with meat and white wine with fish. Have wine at the right temperature. Red wine is ideal to taste at room temperature. White is better when served cold and not chilled. Wine is susceptible to oxidation. An opened wine bottle should be exhausted within 24 hours.